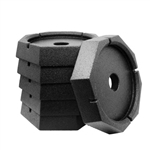 The Equalizer Systems 2367 1 1/2 x 24 Slide Cylinder is a replacement slide cylinder. This cylinder was only used on Forest River Diesel kitchen slides with the cylinder mounted on the side. Body length is 29 11/16"